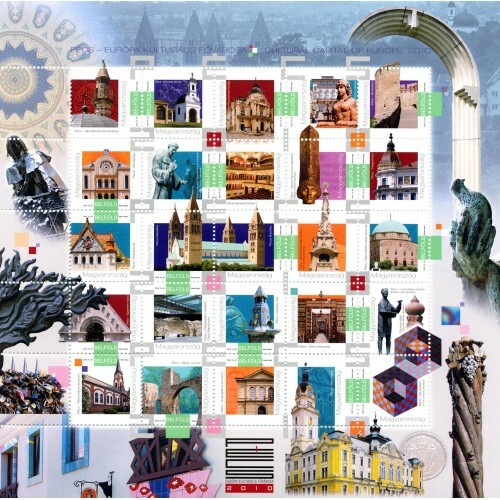 Magyar Posta is issuing a special sheet of ordinary postal stamps containing 25 different stamps to mark the series of events PÉCS 2010 - European Capital of Culture. The stamps, which are released on the official opening day, bear the DOMESTIC value marking and show the sights of the city of Pécs. Every year since 1985, large-scale cultural programs have traditionally been organized by different European cities. In January 2010 three European cities will become European capitals of culture 2010: Essen in the Ruhr Valley in Germany, Istanbul straddling the Bosphorus and Pécs in southern Hungary. The motifs of the stamp designs of the PÉCS 2010 sheet (from left to right and top to bottom) are the Mosque of Jakovali Hassan, the Calvary Hill, the Pécs National Theater, the Hungarian Academy of Sciences headquarters, the Barbican, the Synagogue, the Statues of St Francis of Assisi (by György Bársony), Pécs National Theater, Statue of the Head of Janus Pannonius (by Sándor Rétfalvi), County Hall, Post Office Palace, Pécs Basilica, Mosque of Pasha Gazi Kasim, (By Jenő Kerényi), Zsolnay vase (by Miklós Sikorski), Reformed Church, Ruins of Tettye, Lutheran Church, City Hall, Symbol Sculpture (by János Kerényi), University Gate, Early Christian Necropolis, Septichora Cell, Zsolnay fountain, Victor Vasarely). On the edge around the stamp designs there are other images and motifs characteristic of the city. The design of the first day covers a work by Zoltán Pál on Jókai Square in Pécs, Navel of the Earth. The special postmark has a stylized design of a graphic montage of the sights of Pécs.